Shen Xin, ‘Provocation of the Nightingale’ (2017) Installation view. Courtesy the artist + Baltic Centre for Contemporary Art, Gateshead. First shown at London’s Lychee One earlier this year as part of solo exhibition Strongholds (2017), the work is currently being shown in Gateshead as part of the 2017 BALTIC Artists’ Award exhibition, running June 30 to October 1. Like a knot impossible to untie, or as the press release describes “a kaleidoscope-like effect [where] emotion, judgment, and ethics circulate through individual and collective subjects,” the four videos both support and undermine one another, creating a narrative that never allows for conclusion. 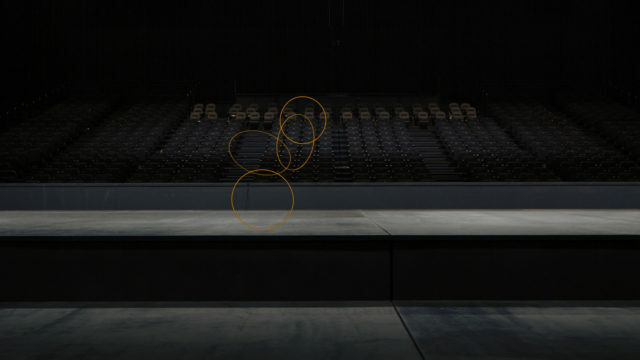 Each video was filmed in a large empty theatre during a residency in South Korea’s Asia Cultural Centre last year, while researching buddhist assimilation in various cultural contexts. Moving between protagonists and perspectives, the multi screen environment creates a complex web of pain, trauma, intimacy, gender, capital, spirituality, science, race and other socio-historical relations. 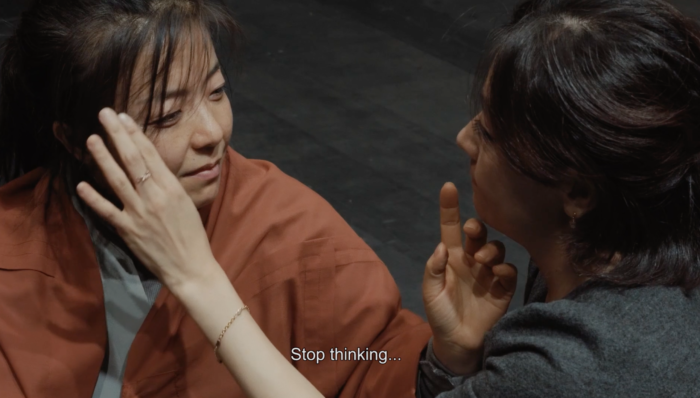 Separated into four screens, the first is a filmic portrait between a meditation teacher and her student who works in the DNA industry, the second includes sound recordings of online testimonials of individuals who have used a DNA testing service to trace their Native and Asian roots, the third portrays two dancers, showing only the moments of pause and rest, and the fourth compiles appropriated footage diverse in content, with parts addressing the violation of women’s bodies. ‘Provocation of the Nightingale’ places you in a whirlpool of Shen’s research and acute personal observations. Entering into an almost trance-like state of viewing, you stop trying to form relationships or draw conclusions, and instead are continually challenged to assess how you come to believe and form opinions about something. “The next project I want to do is very different from this last one because it looks at filming as a sensory experience more.” The conversation organically meanders towards the recent shifts in her practice. Dedicated to the space of ‘opening up’, Shen expands on her interest in the potentials for a more sensory way of making and viewing art as well as her suspicions of discourse and its slippery slope into dogma. 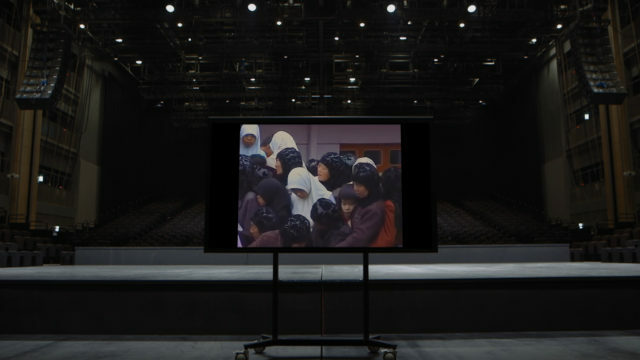 Shen Xin, ‘Provocation of the Nightingale’ (2017) Video still. Courtesy the artist + Baltic Centre for Contemporary Art, Gateshead. ** You never let the viewer, or yourself as the maker, land in one place for too long, everything is being flipped upside down continually, when or where does it stop? Shen Xin: This undermining should be constant and there’s no stopping point. But if you compare it to capitalism and how capital flows, it flows so quickly. But it always lands somewhere, it always capitalizes on something. You can capitalize on resistance, on protest, on rebellion. You can you capitalize anything; criticality, complicity, everything. But what if you can’t, you just don’t have a stopping point? A constant thinking practice. ** Yeah, that’s an interesting approach, like any domain, including pain, can never be a solid thing. SX: Instead of looking at pain in a way that is very much definitive, I’m opening up how it can be distributed otherwise, or how we can view it in a way that it’s not just about the idea of pain. Pain as an idea, like trauma or violence, can be easily used as tools of oppression. In the work itself, I’m not showing you pain, as in showing you how painful things are. I’m actually trying to open up space through the subjects of pain, to resist pain becoming definite. Like, someone could be declared to be sexist or racist, and you deem certain behaviours as that, it also have the power to silence people or stop the cycle of understanding towards the subject. It’s not helpful, in my opinion, to constantly hold on to this power that could be defined by various labels. It’s very tricky, I suppose, and it’s complex in terms of why or how you’re pointing things out. ** I remember you saying earlier that you want to take your work in another direction after this, are you wanting to move away from this theoretical ‘laziness’? SX: I would like to not be bound by discourse in any form. I do not want discourse to pave my way of making work. Some aspects of Provocation of the Nightingale – the work in the Baltic show is very logo centric and driven by the rational, how it’s all composed together and there’s a lot of that control in there – layers upon layers. ** Like a distrust in discourse? SX: Not a distrust, but it’s all much more open than I thought – the thought lies in how I’ve been inclined to read certain books, looking at certain philosophers etcetera. So at one point, I just decided, I’m not going to read any more white male philosophers, and then I discovered a whole different world. There are things I feel much more connected to and realizing that I don’t have to be submissive to a certain kind of readymade. Also, you stop consuming things. When you read theory in your art student life, you’re consuming discourse, or using it as shield for criticality. Before I felt like I had this mode of just shooting certain words out, using them because they feel like the right and safe things to say. And then I realized it is actually rather limiting. SX: I think it’s due to when you solidify the form of discourse then it becomes problematic, so if you take the subject of accelerationism and then you take that as a form and you don’t unpack that form, there’s an understanding in the way that the word or language has been used, which is also prelinguistic in every sense. Criticality feels like the declaration of ‘we’re all on the right side of history.’ I don’t want to make work that can immediately form, and immediately solidify itself. ** When did this all start to hit you, was there a specific moment you can remember that made you gravitate towards the sensory more? SX: I think there are so many moments, one of the main ones was after graduation, and watching people with ‘Counting Blessings’ and they were laughing because they got the point of the film. That was one of the most significant moments for me, and then I realized, actually no, this film is not for you to get. It’s not about me as I’m thinking about not making works as projects but constructing systems. ** How do you remove yourself from that in that it’s not about you? SX: I’m not removed completely but I would like to not be remembered as the person who is more important than the work itself. I mean it’s a really simple thing to say, but it’s just something I strongly believe in – that the work should be useful. And if you remove the idea of ‘me’ in it, the viewer doesn’t think about me, or see me in it, but is free to think about everything else inside it. That’s how I feel about most films that I watch. Of course the director made it and I’ll watch their next film because it’s good but it’s not about the director. When dealing with the kind of capitalism that is functioning in the ego centric art world, if people sort of accept that or are getting accosted that the work is not about the artist, I think that makes some difference. ** Is there anything you’ve seen lately that’s had a big impact? SX: I have recently been very interested in this thing called sensory ethnography. 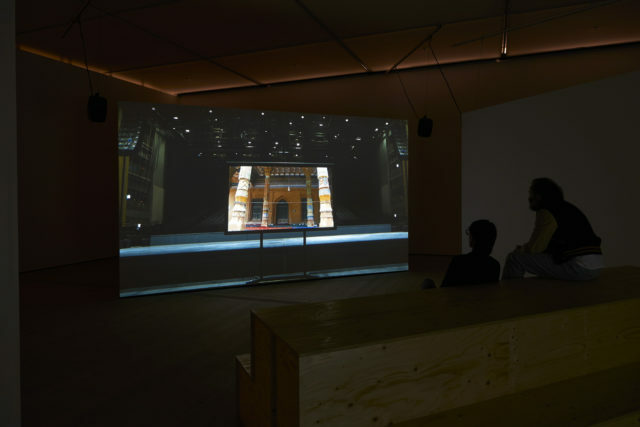 At Kassel Documenta I got completely drawn into a film by Lucien Castaing-Taylor and Verena Paravel and later on discovered ‘Leviathan’ (2012). Basically, there is this very strong sense of the camera being post-human, not in a post-human theory sense but the camera lingers. They [ filmmakers] are slowing the process, they are letting things happen in a way that they don’t take anything for granted, they’re not just collecting materials so they can tell a story. ** I love those moments, those practice-changing moments. Sometimes I catch myself spending too much time thinking about what I don’t want the work to be instead of what I want it to be. SX: I want the works to be functional. I perceive thinking as a form of practice, partly because action is oppressed in many socio-political contexts. [It’s] something that I always have to deal with or learning to work with. It’s like mapping out what you can use to think about things, I suppose. ** And what you don’t want? SX: I can’t define it in a positive sense but I know certain things I don’t want, and one of those is irony. I don’t want irony in my work and I want to strip off any possibility of harboring it, as it sticks to signifiers and symbols. 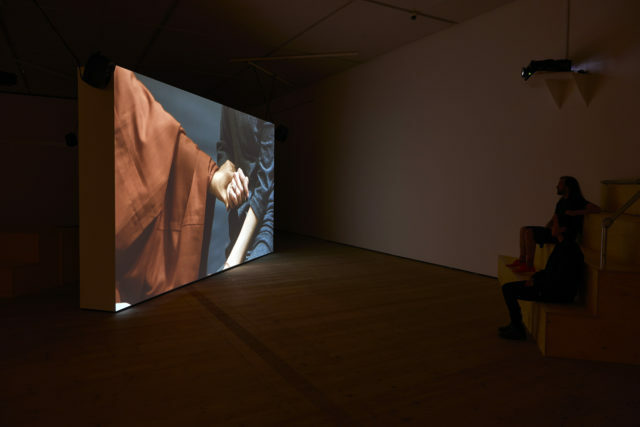 Xen Shin’s ‘Provocation of the Nightingale’ at Gateshead’s BALTIC Centre for Contemporary Art as part of the 2017 BALTIC Artists’ Award opened June 30 and is running to October 1.